Unfortunately, most web pages about birding spots in Denmark are written in Danish only and therefore of little or no use to foreign birders. This page contains links to descriptions of birding spots or birding trips written in English or at least partially in English. Select a spot on the map or from the list below. Depending on your browser, the name of the spot is displayed either on the map or in the status line. Large squares are links to descriptions of several birding spots in a larger region of the country. 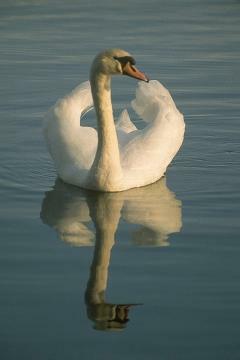 The Mute Swan (Cygnus olor). The national bird of Denmark.